Often, these cancers will occur at a younger than expected age, and if the patient survives, then multiple cancers are commonly diagnosed throughout life. Li-Fraumeni Syndrome is a clear condition of genetic risk leading to cancer. If we consider the most common and known genetic mutations leading to hereditary cancer syndromes, then we can estimate that nearly 350,000 people in the UK and over 1.7 million people in the US are living with genetic mutations, placing them at extraordinarily high risk for cancer development, often at young ages (see Table). Even without a known genetic risk for cancer, nearly half of all men and a third of all women will develop cancer throughout their lifetime (even with two working copies of the TP53 gene). The high risk of cancer in humans fits our life history and also can be partially explained by current evolutionary mismatch2. How, then, can animals help us to treat and perhaps even one day prevent cancer? Virchow’s insight highlights the current understanding that diseases in animals can be extremely informative to the current practice of medicine4. This is important in cancer because despite decades of the war on cancer and now the Cancer Moonshot Initiative, the cure rates for adult cancers remain extremely low. Although immunotherapy seems very promising, many of the latest therapeutic approaches to cancer have not resulted in lasting cure rates. Often, the latest blockbuster drugs, costing hundreds of billions of US dollars in development, only result in a few extra months of overall survival. Cancer remains a formidable enemy, and one that humans have been fighting for only decades while cancer itself has existed since the dawn of multicellularity, around a billion years ago. New approaches will be needed to overcome such an advantage. Comparative oncology includes the search for universal drivers of cancer. The rapid evolution of subclones with discrete mutations in dividing cancer cells makes it difficult to identify genomic drivers vs. passengers in cancer development. When designing new therapeutics, this distinction becomes important as it would be futile to develop a new drug that targets an epiphenomenon rather than the true initiator of tumorigenesis. In canines, we have the opportunity to try to identify universal causes of cancer risk as well as tumour progression5. The world of dog breeding has created a domesticated species of companion animal over the past 15,000 years, and as a result of massive inbreeding to create the perfect pet, many purebred dogs now remain at exceedingly high risk of developing cancer. In fact, purebred dogs will develop cancer at over 11 times the rate of humans with a much shorter latency time given the normal lifespan of less than 15 years in a healthy dog. The risk for cancer is extremely breed specific (5, see Table 1), and is driven by the genetic makeup of each unique dog breed. This genetic risk can be compared to human families with similar cancer subtype propensity, setting up a unique and powerful situation to identify universal genetic risk factors for specific cancers. This becomes important therapeutically, as the genetic risk for specific cancers in dogs (and familial cancer in humans) can now be explored within the tumour itself to identify a new druggable target. The actual genomic make-up of the tumour can also be explored to try to find which genes or pathways are simultaneously altered in both dog and human cancer, again, providing novel insight into universal drivers of tumour progression and potentially new targets for developmental therapeutics. We recently demonstrated the success of this approach when comparing human and dog bladder cancer and identifying alterations in PABPC1, CDKN2A, S100A8/9, and LRP1B as potential candidates for further exploration as universal drivers of bladder cancer6. On the opposite end of the spectrum is the exploration of animals that seem to be cancer resistant rather than cancer prone7. Peto’s paradox is the curious phenomenon first described by Sir Richard Peto that animals with large body mass and longevity (e.g. elephants or whales) should develop cancer at an extremely high rate yet seem to be protected from cancer risk. This, of course, makes sense in the context of evolutionary thinking, as if these large and long-lived animals were not protected, then they would all succumb to cancer at an early age and limit their chances at reproduction leading to possible extinction. 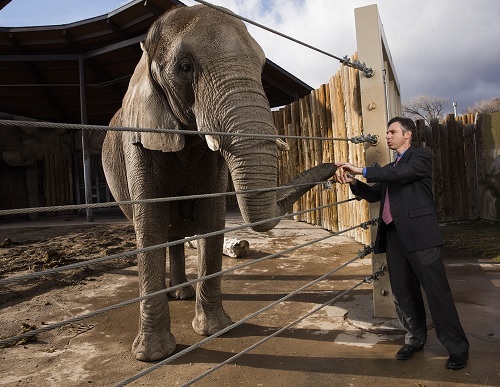 Dr. Carlo Maley, now at Arizona State University and a member of The Institute of Cancer Research (ICR) Centre for Evolution and Cancer in London, made the observation that elephants have evolved 40 copies of the tumour suppressor TP53, the same gene lacking in Li-Fraumeni Syndrome. Working together with Dr. Maley, we recently demonstrated that the elephant TP53 gene is both transcribed into RNA and translated into protein8. Moreover, elephant lymphocytes and fibroblasts (with their 40 copies of TP53) have more than twice the amount of apoptosis than human cells (with two copies of TP53) when exposed to DNA damaging agents like Doxorubicin and ionizing radiation. The p53 pathway is triggered during this apoptotic response in elephants, and in fact, the response is over five times as great in elephant cells than cells from patients with Li-Fraumeni Syndrome with only a single TP53 gene that functions. These elephant p53 (eP53) genes seem to preferentially trigger apoptosis over DNA repair when the elephant cells are exposed to DNA damage8, and 19 versions of eP53 are retrogenes that have been reinserted throughout evolutionary time. With 55 million years of evolutionary time to develop a cancer resistant strategy, elephant p53 could yield important new clues and weapons in the ongoing fight against cancer. Through comparative oncology, we can learn from evolution how to better understand both the universal drivers of cancer (e.g. in dogs) and also novel evolutionary strategies for cancer prevention (e.g. in elephants). As every animal, including humans, has its own evolutionary history, we remain at the beginning of a very exciting and informative time for the rapidly developing field of comparative oncology. McBride KA, Ballinger ML, Killick E, et al. Li-Fraumeni syndrome: cancer risk assessment and clinical management. Nature reviews. Clinical oncology. May 2014;11(5):260-271. Greaves M (2007) Darwinian medicine: a case for cancer. Nature Reviews Cancer. 7: 213-221. Aktipis CA, Boddy AM, Jansen G, et al. Cancer across the tree of life: cooperation and cheating in multicellularity. Philosophical transactions of the Royal Society of London. Series B, Biological sciences. Jul 19 2015;370(1673). Nunney L, Maley CC, Breen M, Hochberg ME, Schiffman JD. Peto’s paradox and the promise of comparative oncology. Philosophical transactions of the Royal Society of London. Series B, Biological sciences. Jul 19 2015;370(1673). Schiffman JD, Breen M. Comparative oncology: what dogs and other species can teach us about humans with cancer. Philosophical transactions of the Royal Society of London. Series B, Biological sciences. Jul 19 2015;370(1673). Shapiro SG, Raghunath S, Williams C, et al. Canine urothelial carcinoma: genomically aberrant and comparatively relevant. Chromosome research : an international journal on the molecular, supramolecular and evolutionary aspects of chromosome biology. Jun 2015;23(2):311-331. Caulin AF, Maley CC. Peto’s Paradox: evolution’s prescription for cancer prevention. Trends in ecology & evolution. Apr 2011;26(4):175-182. Abegglen LM, Caulin AF, Chan A, et al. Potential Mechanisms for Cancer Resistance in Elephants and Comparative Cellular Response to DNA Damage in Humans. Jama. Nov 3 2015;314(17):1850-1860. Thanks for letting us know about cancer.